Here are disassembly instructions for the RCA 630TS which also apply to the nearly-identical 8TS30. When handling the large and fragile picture tube, heavy clothing, gloves, and safety goggles must be worn. The tube contains a high vacuum. Should breakage occur, a violent shattering of the glass is likely. The tube is also quite sturdy to withstand tremendous atmospheric pressure. Handling it as one would handle any large and expensive glassware (taking special care that it is not dropped or struck sharply and that only moderate pressure is used in grasping or manipulating the tube) is typically adequate to prevent breakage. Under NO circumstances should the tube ever be lifted by the fragile neck. Always grasp the large end of the tube with both hands when lifting or carrying the tube. First, remove the metal back cover plate by loosening the screws (B) as shown below. The 8TS30 is nearly identical to the 630TS. Next, remove the "top hatch" of its cabinet which is secured by two screws at the upper rear (A) as shown in the figure. Once those two screws are removed, the top hatch may be removed by tilting the rear edge upward, sliding the hatch backward about an inch, then lifting it off. Next, the anode wire needs to be unplugged from the upper wall of the picture tube. It consists of a thick wire, rubber insulating cup, and a metal plug which fits into a recessed connector which is set into the glass shell of the tube. Grasping the rubber cup and gently pulling upward should be sufficient to remove it. Next, gently grasp the base of the tube which is located at the end of the tube neck near the rear of the cabinet and hold the base and neck steady. Note the socket connector (P) attached at the rear. While holding the neck steady with one hand, gently slide the socket off the base of the tube. 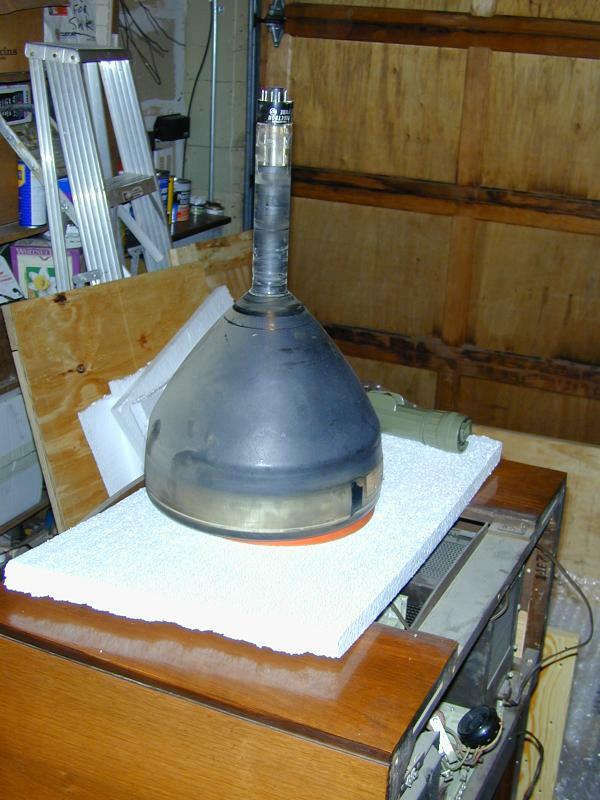 Next, locate the ion trap magnet which is located on the tube neck slightly in front of the tube base. Some types are clamped in place by a pair of thumbscrews (O) on the trap assembly, while other types are held in place by gentle spring tension and have no thumbscrews. If your set has the clamp-type trap, loosen the thumbscrews until the trap magnet moves freely and simply slide it backward and off the tube neck. If the one in your set is the ring type, it can be gently slid off the tube neck. As with removing the tube socket, be sure to hold the neck steady while removing the ion trap magnet. Next, remove the two screws noted as “Q” in the figure (below left) and remove the cabinet front panel as shown (below right). Loosen the two screws “L” holding the UPPER pair of centering slides “M” which steady the picture tube in the cabinet front. Do not remove the screws, simply loosen them until the slides move freely upward and away from the tube, then re-tighten the screws just enough to hold them steady in the raised position. The two slides in the lower corners (M) should be left in place as they are supporting the weight of the heavy and fragile tube. When handling the large and fragile picture tube, heavy clothing, gloves, and safety goggles must be worn. The tube contains a high vacuum. Should breakage occur, a violent shattering of the glass is likely. The tube is also quite sturdy to withstand tremendous atmospheric pressure. Handling it as one would handle any large and expensive glassware (taking special care that it is not dropped or struck sharply and that only moderate pressure is used in grasping or manipulating the tube) is typically adequate to prevent breakage. Gently grasp the tube from the sides as shown and carefully withdraw it. If it seems stuck, gently return it to its original position and investigate and correct the cause of the difficulty. Do not force the tube. Once any “sticking” issue is resolved, re-try removal. Set the tube face-down on a cushioned surface (a towel works well for this) if it must be set aside before packing into its shipping box. Wrap the CRT socket and ion trap in a small bag and secure them to the focus coil bracket with a large rubber band as shown at “D” below. 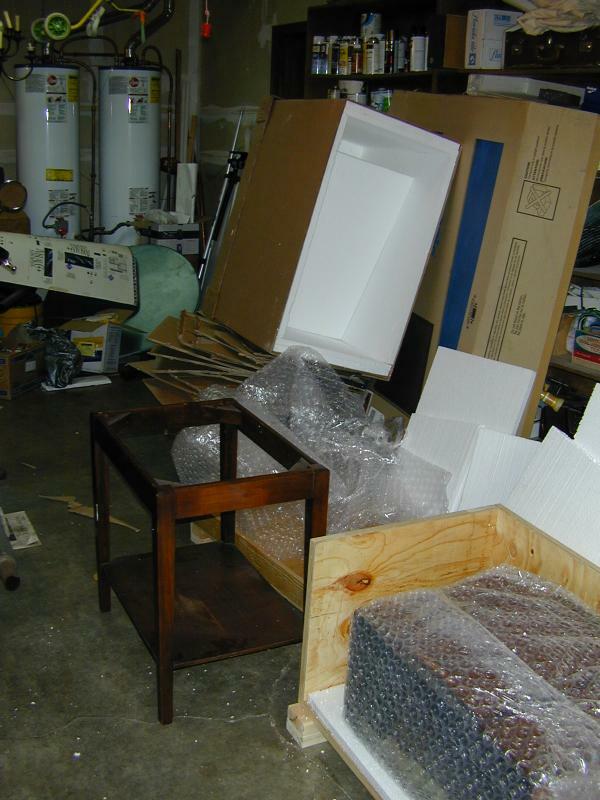 Wrap some cardboard around the large tube nearest the cabinet back as shown at “E” and secure with another rubber band. Thread the power cord through the cabinet past point “H” and bundle the cord into another bag and secure the bag using a rubber band at point “F” Wrap a rubber band around the cord and secure the cord also at point “H” as shown. Next, remove the control knobs from the front of the set. They are “push-on” type and may be simply pulled off their shafts. Place the knobs in a small bag along with the pairs of top hatch and front panel mounting screws. Secure the bag to the cabinet crosspiece at “G” as shown. 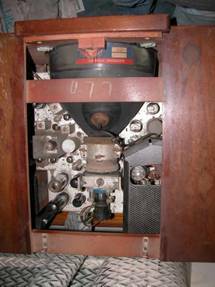 Next, re-attach the cabinet front panel & top hatch, then fabricate a cardboard spacer as shown at (C) to protect the structures located behind the set's exceptionally heavy power supply section. This step is important to minimize the risk of damage to the set's antenna terminal plate or bending of the back cover in this critical area of the set's structure. Note that these photos are from the original RCA unpacking & setup instructions provided in the Owner's Manual and Service Manual. All of that sounds straightforward, but 60-year old TVs often harbor surprises. As a small example, the clamp that holds the ion trap on the neck of the picture tube has a nice little rubber pad inside the clamp to protect the CRT neck. In this set, the rubber pad had bonded to the neck glass as if glued on with epoxy. Perhaps the rubber slowly melted over the years from the heat of operation. The author was eventually able to remove it by completely disassembling the ion trap and gently peeling off the rubber. Things like that are the result of age, and you won't find them mentioned in any service manual. You just have to be resourceful and deal with issues as they arise. 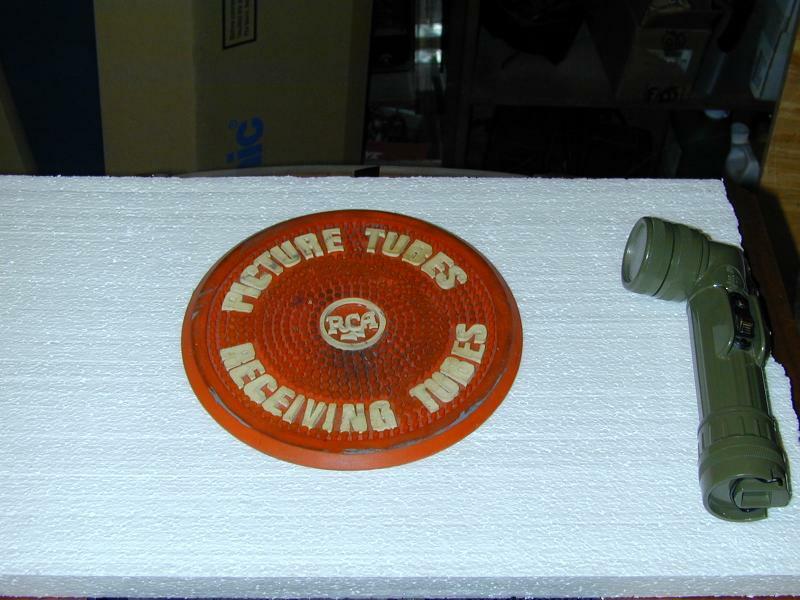 When you're removing a vintage CRT, it's nice to have a vintage rubber picture tube mat to put it on. Hey, it's even the correct brand! Notice how thin that CRT neck is. Handle your 10BP4 tube with care! The bell is heavy. Always carry the CRT by grasping the front with two hands, not by grabbing the fragile neck. Here is an image of the original RCA shipping cartons which may be helpful in planning the packing of the set. 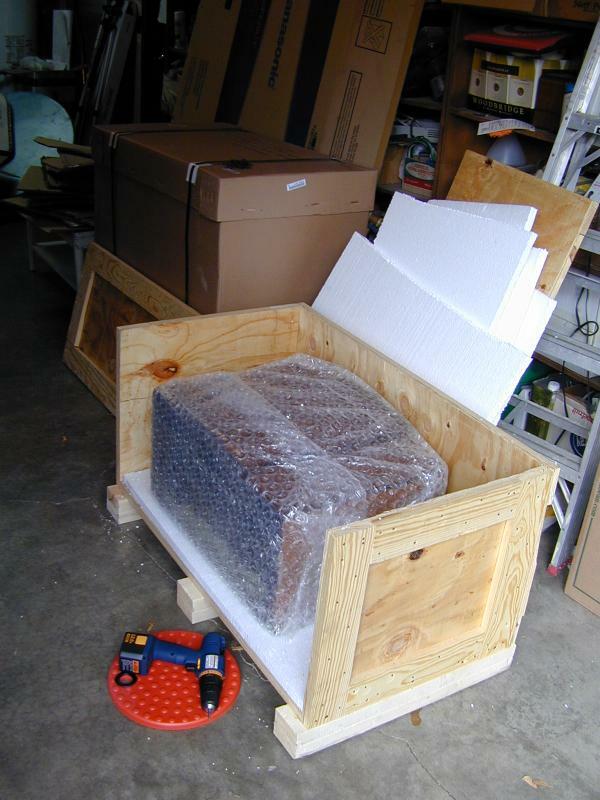 I prefer wooden crates for the heavy chassis/cabinet assembly. 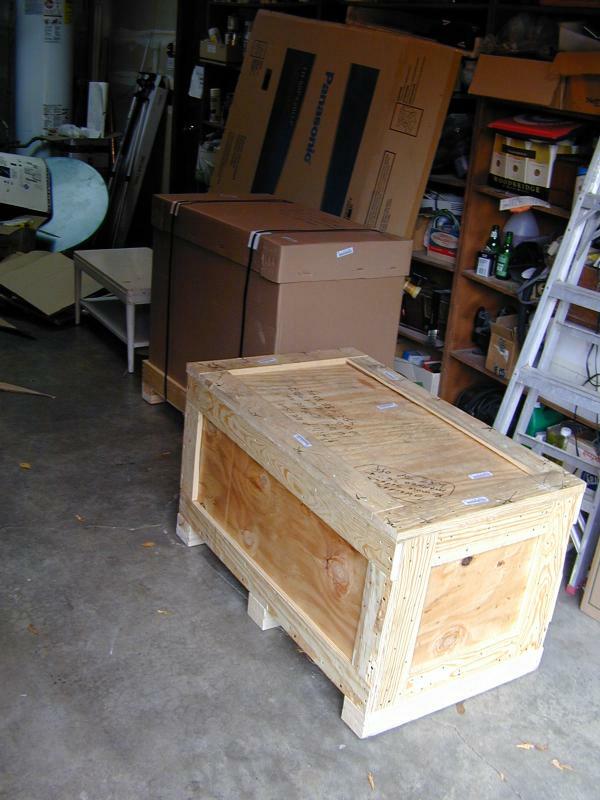 I prefer wooden crates for shipping the heavy chassis/cabinet assembly. Email john@amptechsystems.com if you have any other questions. I also have a copy of the Assembly Manual in pdf format and can email the large (60 MB) file if needed.